Have you found an online vendor selling Damoiseau VO? C'est le rhum que je bois le plus étant donné son rapport qualité/prix. Damoiseau cultivates a different terroir sugar cane of the Guadeloupe archipelago, which may be because of its windward position, flatter land (akin to Mare-Galante) and soil differences. It tastes a bit more metallic and musky than the others, something I don't really love (and for some reason reminds me of rust or a ripe tomato), but respect as they are the only distiller still in operation on Grande Terre and bring a unique profile to the rhum agricole of these islands. The VO does not have a crazy agricole flavor upfront, as one would expect, but flashes a strong alcohol fire in the nose - a little spicy - and hits more caramel-flavored territory à la other aged demerara spirits. Similar to Diplomatic Reserva, although nowhere near as sweet. Do note the VO rating applies to Brandies and Cognacs, and generally Martinique rhums are the only ones recognized as being able to market themselves in such a manner because of their AOC. 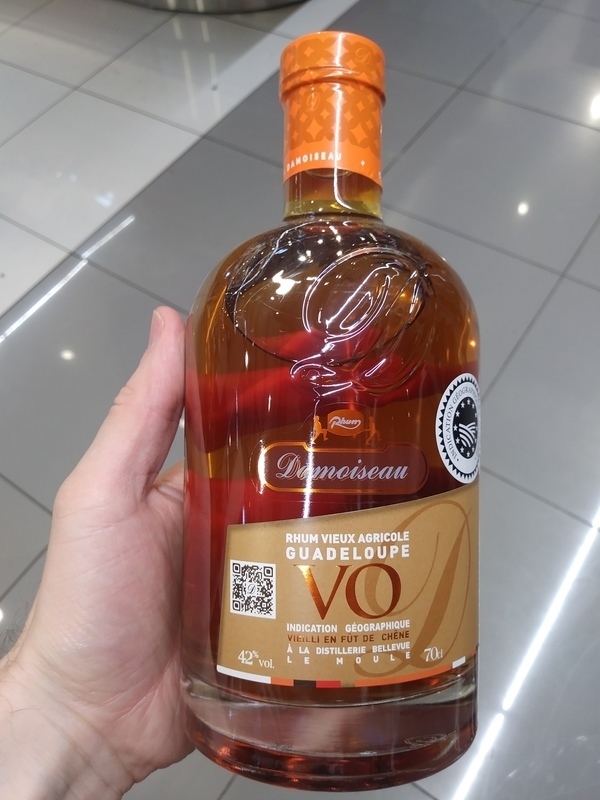 Visited the Damoiseau Distillery in Guadeloupe and bought a bottle of Damoiseau VO from the distillery since their tasting bar was very limited. Nice looking and high end bottle and label design. Light golden color. Typical dry Rhum Agricole flavors alongside grass, citrus fruits, floral notes, vanilla and plenty of oak followed by a strong burn being so dry. Rhum Agricole fans can easily add 2 points to my score. The nose is very nice, caramel et trés doux. En bouche, strong mais pas trop, a little to much alcohol taste for me, but over all not bad at all !!! Kdyby měl hodnotit zajímavost a pestrost rozhodně by dostal 9b, jenže mi nepřijde, že je to rum. Šílenost chutí se mi nedá zapřít, ale nemůžu mu dát vyšší body, aby mně to nemátlo. Není to můj šálek kávy. Rozhodně ne. Le nez est très caramel le, l'attaque douce avec des notes de fruits confits, et de caramel, aucune note florale ou végétale. Bonne longueur en bouche. the smell and taste has something of banana. light body, not so bold. sugar cane grassy aftertaste. good, but not exceptional rhum. a little bit of wooden spice. the 5 year is much better, i think. although to show banana in a rum, this sample is great! Ce rhum peut se triuver en super marche a 20 euros.il est assez bon rapport qualite prix.moins bon que le vsop il est bon toutefois pour cette gamme de prix.A essayer pour debuter un vieux rhum francais.note 6.6. Rhum vieilli en fut de chêne (3 ans), boisé avec une entame sèche et une longueur en bouche envoutante. Une très bonne "base" dans la plus pure tradition française, à déguster sec sans glace ou avec des pierres. Rapport qualité/prix imbattable, facilement trouvable en supermarché (entre 20 et 30e). Guadeloupe je zámořský departement a zároveň zámořský region Francie ležící v Karibském moři přibližně 600 km severně od Jižní Ameriky a 600 km východně od Dominikánské republiky. Jedná se o dvojostrov v Závětrných ostrovech Malých Antil. Jako integrální část Francie je Guadeloupe součástí Evropské unie s postavením tzv. „nejvzdálenějšího regionu“. Shrnutí:	Zajímavý a originální rum, který zraje 3 roky v sudech po bourbonu, není bez chybičky, ale myslím, že si budeme rozumět. Za originalitu zaokrouhluju nahoru.